First, I would like to wish my son a very Happy Birthday! 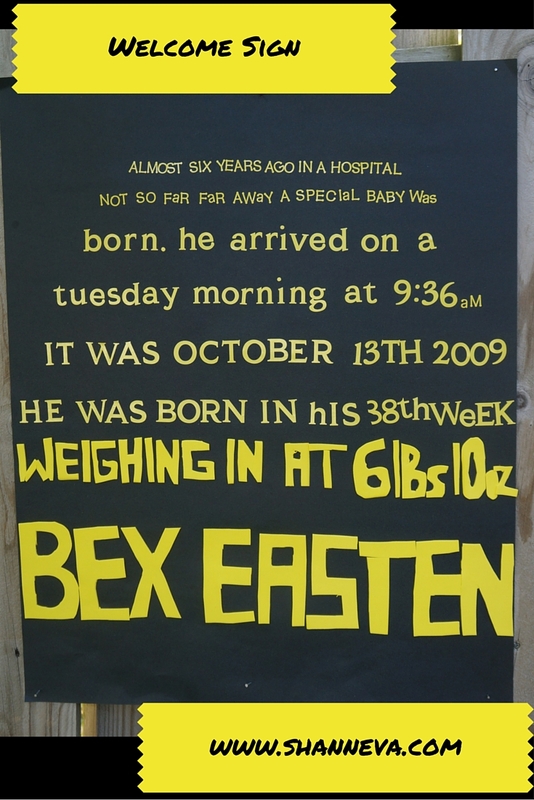 Today is his actual birthday, and 6 years ago he was born on a Tuesday morning at 9:36 am. He is my creative genius that never stops talking or thinking or building or drawing. Sometimes, he drives me crazy, but I love him so much. He is my favorite cuddle buddy, he is too smart for his own good, he is very sensitive, and keeps us all constantly entertained. Happy Birthday Sweet Boy! Now, onto some more fun stuff! Have you guess the theme of the birthday party yet? I had a really great time planning this birthday party. I mixed it up between store bought things and my own decorations. Almost everything I bought was on clearance. If it wasn’t on clearance, then it was on sale. I actually bought up a bunch of Star Wars stuff when it went on clearance at the beginning of summer. Now, they are rolling it all out again with the new movie coming up, so I was able to complete my decorations. 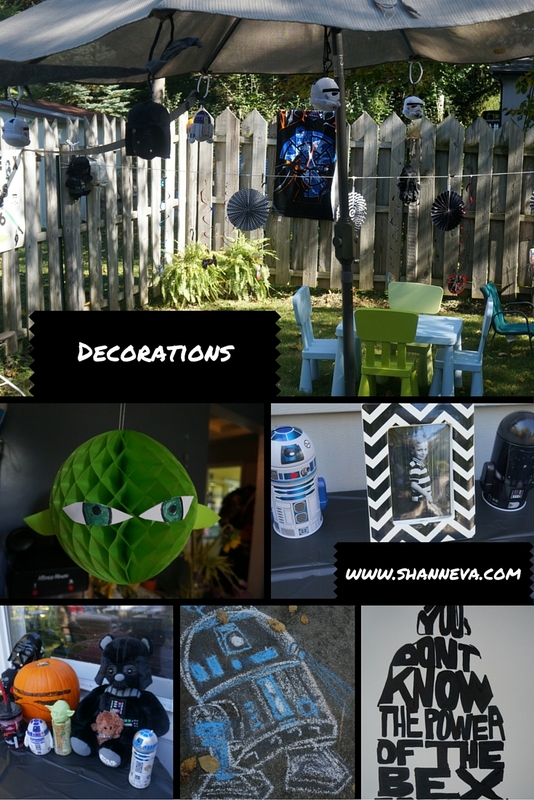 If you are planning a Star Wars party anytime in the future, I suggest hitting the after Halloween sales, then looking again after the movie is released. There should be some great deals. I was a little stressed early in the week, but then everything started coming together, and I was just excited. On the day of the birthday party, we had beautiful weather, the kids were in a good mood, and the party went off without too many hitches. As you know, I bought the cake. I’ve never had a problem with Sam’s Club before, but when we went to pick it up, there was a line of people waiting. Some people had even ordered their cakes two weeks ahead of time, and NONE of them were done. The cake decorator called in sick that morning. This should not have been something too out of the ordinary, so they should have been more prepared. We did get a cake, but wasted about a half hour waiting. However, that was our biggest problem of the day, so it really wasn’t that big of a deal. Now, on to the birthday party. I’m going to share a bunch of pictures today, then come back to the blog this week and next week as I break it down into a post all about the decorations, all about the food, and all about the goodie bags/fun stuff for the kids. First, here’s the cake, and the kids. Next, you will see our backyard. Hooray for nice weather!!! Now, I know the handmade signs and decorations aren’t perfect, but a lot of work and love went into them. I really like making crafts, especially for my kids. My husband, who is the real artist, did the fabulous R2D2 chalk drawing above. Sure, I could have printed the sign below and used graphics like the picture in this post at the beginning, but it felt better to make it myself, and my son even helped out. We, of course, had a Pinata, as we do every year. My Darth Bear from Build-a-Bear, which I got for my birthday (I’m still a big kid when it comes to stuff like that!) A plastic pumpkin made into Darth Vader, a box for cards from Hobby Lobby (my new FAVORITE store, which just opened here!) and bags for all the Pinata candy, that I decorated to look like Storm troopers. So, tomorrow, I’ll have a recap on the “Actual” birthday, but Wednesday, I’m going to tell you all about the party food. Oh my goodness! 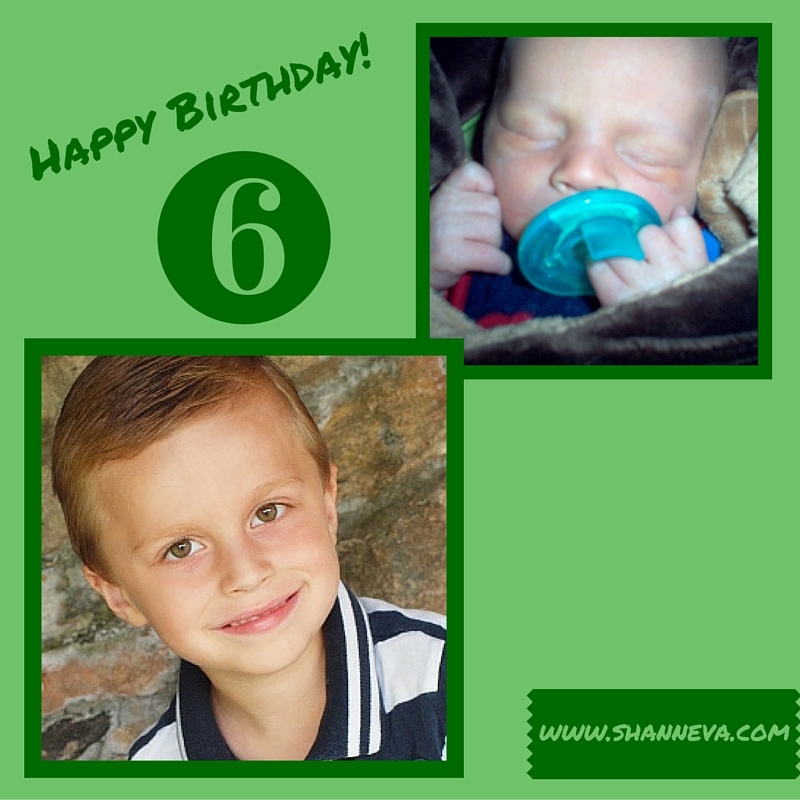 Happy birthday, sweet boy! I love seeing all your posts from parties,etc. You are so creative!!! Everything came out great! Oh what fun! This was a great birthday party theme, and your decorations were amazing! It sounds like a perfect special day! That is super cute! We are having my daughters 1st birthday this weekend and it is Mickey Mouse Clubhouse theme. My twins LOVE Mickey Mouse Clubhouse. Can’t wait to see pictures from your party! This is AWESOME!!! Looks like everyone had a great time 🙂 Happy Birthday to your son!!! So fun! Even that graphic is amazingly coordinated! So fun! I love your opening picture with the words! I did a Star Wars party a few years ago. It was so fun! Can’t wait to read your next post! Wow, you did an amazing job! I love the welcome sign and happy bday to your son! what a fun party! I love the treat bags!! Yes, its official. I’m hiring you to take care of all my future parities. You did an amazing job! That is so creative and cute! My husband also has a Darth Vador Build a Bear too. I am sure we will be doing tons of Star Wars bdays over the years so thanks for the cute ideas. Those loot bags are just adorable. 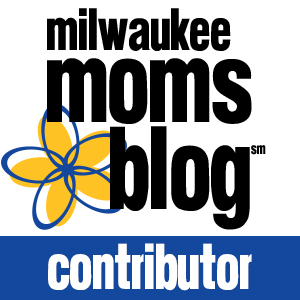 Wow – what a cool party! Glad everything worked out with the cake. I’m sure you were relieved. I can only imagine how much planning goes into a party like this. Lots of details, and you want everything to be perfect. Wow those are some amazing decorations! 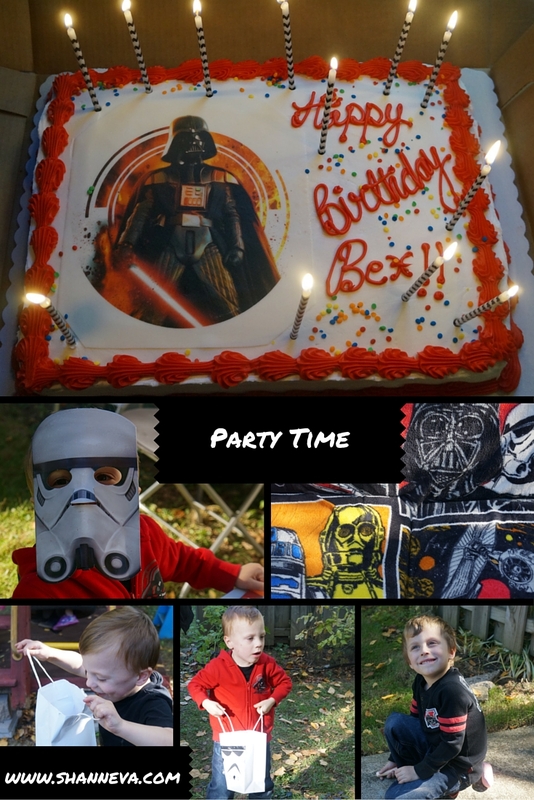 We have quite a bit of Star Wars memorabilia around our house so I’m sure this birthday would be a hit! How fun Shann! It is amazing how fast they grow 🙂 Thanks for sharing!! Oh how fun! We love all things Star Wars in our house. Looks like a fun party! I love the Star War theme! Isn’t it crazy how fast time goes by? My oldest is going to be turning 10 next year! It IS crazy. I can’t believe it. Happy Birthday to your little boy. What a great theme. My sister-in-law loves this kinda thing.. I bet one day she’ll be making a Star wars party for my nephew too. Thanks for sharing, great job mama. I love seeing ideas for birthday parties. My boys love star wars. My youngest son’s birthday is Saturday. I would say it is more police car themed with a side of John Deere. Happy Birthday to your son. I can imagine the effort you put into this party which turned out to be very successful. 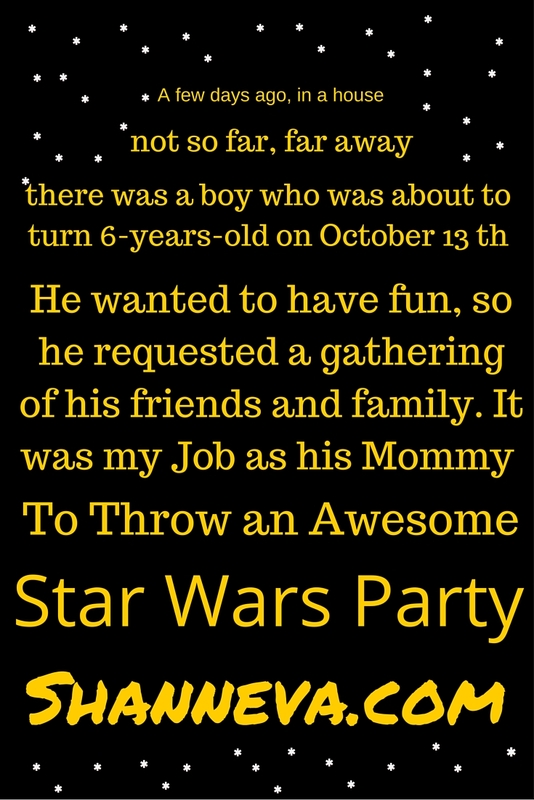 i believe you son will never this ‘Star War” birthday. They are lucky to have you as parent. Thank you so much Stella. I appreciate that. That looks amazing!! I wish it was my bday!!! (Mine are no longer as fun and I definitely don’t look forward to them anymore lol)…Wow what an amazing job!!! Awww! Everything looks like it turned out just perfect. The weather was nice, your boys look happy, and from me to you, you are a COOL, fun mom! I love the little star wars themed story. This is AWESOME! Way better than all the guesses! You outdid yourself! Heres to another year of raising little boys! They keep you on your toes. Happy b-day to your little guy! Awe. Thank you so much! You went above and beyond! What a fabulous job you did and I love the treat bags! They certainly are. My twins, who are three, are all about Thomas right now. Wonderful! I was eager to see what you’d come up with. You did such a great job!! My favorite were those hanging yoda balls. Happy 6th Bday Bex! You out did your self again all for the sake of your child thats what mothers do. Amazing birthday party. Happy Birthday. Looks like he had an amazing birthday party! He is so lucky! You did a great job with all the preparations. Sounds so much fun. Happy Birthday to him! Oh mu gosh! I love the theme! My son would go ballistic if he sees this! Hahaha! Love the cake! Well done mama! You know you’re doing a great job as a parent when your kids love Star Wars. Hehe. 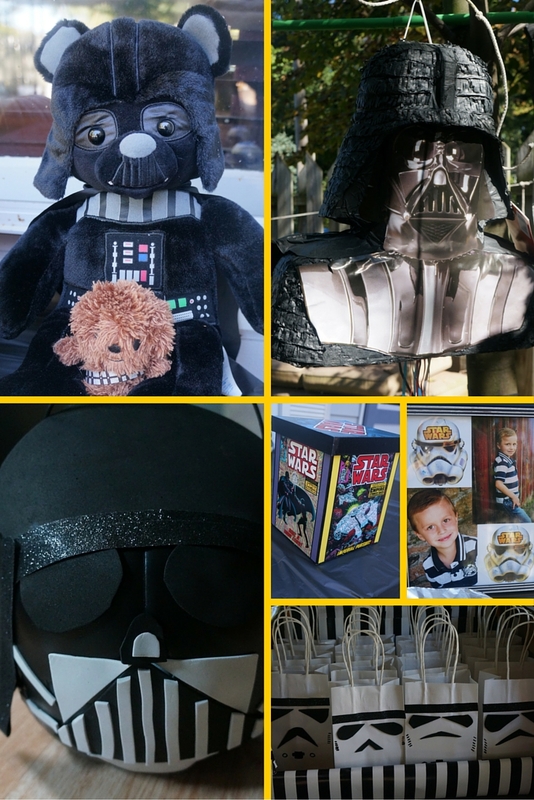 Awesome theme for an awesome little boy! Happy 6th birthday! Good job, mama! We are a Star Wars home so I love it all! HBD to your cute boy. My husband loves Star Wars. I see my son having a birthday party just like this. Happy Belated Birthday young man! I am sure he had a whale of a time – who wouldn’t with all those activities! You are a great Mom! Thank you so much Claudette. I really appreciate your kind words. Thank you! Yes, it was a great birthday. This is so cute! My boyfriend loves star wars! I might just use this as inspiration for his next b-day! Yes! You should! Thank you. Very creative and looks like everyone must have had a great time. My daughter also plans themed parties for her girls, my only grandchildren so far, who just turned 1 and 3 over the past couple months. It really is fun and adds a lot of excitement for the kids and their party guests. What a great birthday party theme! This kids would love it! Really cute party! So many details! This is SO fun! I love the Yoda decoration! This party looks so fun! My guys are really into Star Wars too!